Church Hospitality is not evangelism. I’ve written in the past about the connection between Christian Hospitality and Evangelism, particularly as to the connection to welcoming first time visitors. I can’t silence the pain. But I want to develop a little more depth on church hospitality with regards to helping welcome church visitors who may be coming for the first time. inviting others to share in our community life. However, for our purposes here at EvangelismCoach.org, we’ll focus specifically on the connection between church hospitality and Evangelism. All sorts of corporations that interact with the public have studied hospitality, implement training programs to improve their public interaction, and spend millions on hospitality consultants. We see its effects in store personnel trying to greet us as we walk in the door, training customer service reps to speak gently on the phone and check out clerks that smile (in many stores anyway). These corporations want you to remember the good experience that you’ve had in their presence and will likewise want to return. They want to remove potential bad experiences so that you willingly spend money on their product, experience, or merchandise. By creating a “good experience,” you’ll want to return and spend more. How can the local church lower the barriers to hearing the message that will be proclaimed? Church Hospitality is only one tool in the church’s ability to be evangelistic. Hospitality is not the only tool and should not be confused with evangelism itself. Rather hospitality can lower and remove the potential barriers that can harm the gospel message during the worship service. As I think of my experience visiting churches for the first time, and as I’ve listened to others who have made first time stranger visits, one thing has consistently risen to the surface. Lots of anecdotal evidence suggests that the ability of a first time visitor to connect to the worship service was directly impacted by the warmth of the welcome experienced. When no one says hello, the perceived coldness hinders your ability to remember what the sermon was about. When people are staring at you for not dressing right, you want to hide, but feel trapped. Can’t pay attention. In both examples, the ability of the first time hearer to interact with the sermon (the central part of most worship experiences) is hindered. However, when a guest is given a warm welcome, a greater openness and ability to engage and comprehend the sermon remains in place and a greater likelihood (from a human point of view) of greater connection to the local church during that stage of their spiritual journey. A warm welcome is thus part of the pre-evangelism work necessary in a church’s mission to help people find faith in Christ. Do You Welcome Church Visitors? Take a personal moment and examine your heart on this matter. When people meet you for the first time, how do you think they perceive your personality, disposition or attitude? When you extend a hand to shake when a guest walks through the church’s front door, are they interrupting your conversation with someone else, or do you offer them genuine interest along with a hand shake (a typical greeting in the US)? How do you treat the unknown person who sits next to you during the worship service? How do you welcome the visitor who sits behind you, or in front of you? Look at them and say nothing? Take the initiative to greet them? Remember, we are Christ’s ambassadors (2 Corinthians 5.20). Our actions and reactions communicate who we are and who we represent. Do you want help developing your church hospitality? Break the Barriers DVD set (4 DVD set aimed at helping you identify and remove barriers). 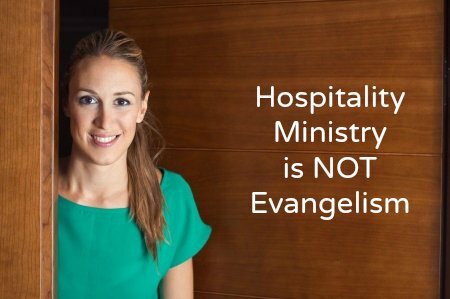 Church Hospitality Ministry is not Evangelism! In the Arab World is always practical to offer snacks and tea and have some time of fellowship following the gathering. This lets everyone get to know each other a bit better as opposed to everyone rushing out. Thanks for dropping by and adding your comment. In many Hispanic contexts that I work in, that time of fellowship after the gathering doesn’t exist. People simply leave. Last week, however, I was in a church as a guest preacher and they had a time of fellowship after the gathering. In 10 years of ministry over 5 countries in the Latin/South America, this was the first church I had been to that had that fellowship time. Perhaps it’s an idea that needs to be exported to other parts of the world? Very well said. I have been to churches where no one said hello. It was difficult to tune in to the sermon.